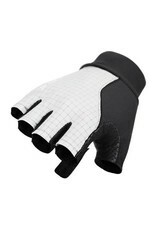 A stripped-down and essentialist modern Grand Tour summer glove. 13.3g per glove. Lightweight and highly breathable, like the entire collection, these gloves have been constructed with minimal padding in the palm area (for nerve protection), synthetic leather micro-perforated mitts and Japanese synthetic suede details. The uppers use a bacteria-static polyamide/carbon fibre which the rider will notice provides a particularly crisp and fresh tactility on demanding rides. There is also a small micro-fleece towel below the thumb and forefinger. The glove has been cut with a ‘pre-shape’ pattern, meaning that even when unworn it curls forward in the wrist and thumb-forefinger areas, mimicking the riding position of the hand, for the smoothest flowing hand movements when worn riding. The same barely-notice-you’re-wearing-it feel of the Q36.5 Ultralight sock.